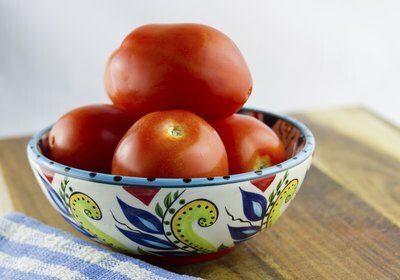 So, you’ve decided to can your own sauce, tomato paste, whole tomatoes or salsa, and you wonder if it makes a difference what types of tomatoes (Solanum Lycopersicum) you use. The variety of tomato does make a difference in how well your canned product will turn out. While juicy, acidic varieties are great for eating fresh, in canning, it is best to use and grow the meatier varieties that include "Brandywine," "Roma," "Amish Paste" and "San Marzano." "Roma" tomatoes are the standard by which all other canning tomatoes are judged. They are one of the most often-used tomato varieties for canning and for good reason. They make especially good specimens for canning tomato paste. Some types of "Romas" perform better than others, particularly the "Roma VF Paste" and "Italian Roma" varieties. 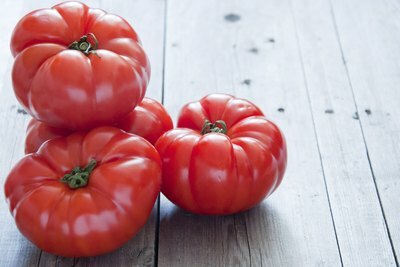 "Roma VF Paste" tomatoes are specially bred to have thick walls for canning; however, their fruits are slightly smaller than the "Italian Roma" variety, weighing 4 to 5 ounces, compared to the "Italian Roma's" heftier 5 to 6 ounces. Additionally, "Italian Romas" are determinate, meaning that they will tend to decline after the first four to six weeks of fruit production. "Roma VFs" are semi-determinate, and so will last longer through the summer. The "Italian Roma" has a higher sugar content and so will lend your canning a sweeter flavor. Both varieties mature in about 75 to 80 days. "Brandywines" are one of the best tomatoes for all kinds of canning. Because they are meaty rather than juicy, they are suitable for canning whole, as well as for putting up pasta sauces. They are generally easy to grow, and heirloom varieties of the plant can usually be found readily at garden centers. The pink and "Suddath Strain" are the most common varieties. All types of "Brandywines" are indeterminate and fruit until the first frost. "Pink Brandywine" takes a little longer to mature, fruiting in 90 days compared to the "Suddath Strain's" shorter 80 days. Both varieties are large and can grow up to 24 ounces. As one might guess from their name, "Amish Paste" tomatoes are most commonly used for canning tomato paste. They have a sweeter taste than "Romas" and are one of the larger paste tomatoes. Because they grow in a narrow vine shape rather than a wide bush shape, they are a good option if you have limited space in your garden, because they can be staked and grow upward rather than out. They are indeterminate with a long growing season and take around 75 days to mature. 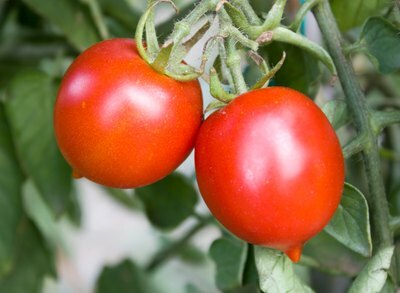 The fruits have a tangier flavor than other tomatoes and are medium-sized, growing to between 8 and 12 ounces. "San Marzanos" also make great paste tomatoes. They are slightly smaller than "Romas" but contain fewer seeds per fruit and also have thicker seed walls, so there is plenty of meat to the fruit. They also hold on to the plant well after ripening. Additionally, they have a slightly less acidic taste than "Romas." The most common variety is known as "Heirloom San Marzano" or "Organic San Marzano." They are indeterminate and take about 75 to 80 days to mature, with fruits weighing around 3 to 5 ounces. 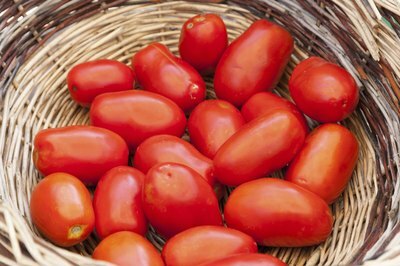 Another well-known "San Marzano" variety is the "Redorta" strain, which is slightly larger, growing as big as 8 ounces. It is also indeterminate and takes 70 days to mature.